One creative bunch of lads responded brilliantly after one of their close friends stopped going out when he got a new girlfriend. When Keiran Cable became all loved-up and dove head first into a new relationship, his social life took a massive hit and his mates hardly saw him anymore. 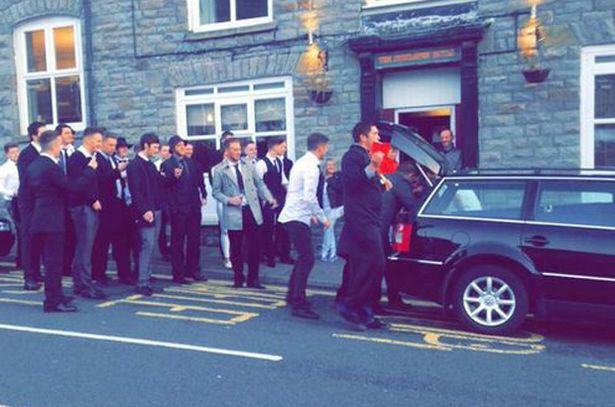 So, to get back at him, this group of guys took things to a whole new level and actually organised a surprise ‘funeral’ for the 20-year-old. 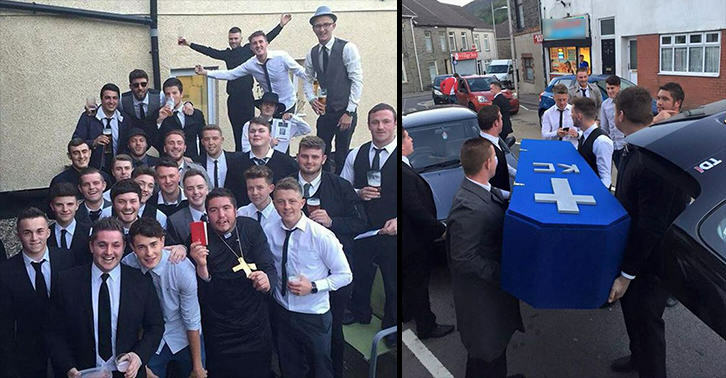 As reported by Wales Online, the group of roughly 50 friends, who play for the local Prince FC football team in Treorchy, Wales, hosted the funeral. And the lads spared no expense on this one, with the mock funeral coming complete with a coffin, a funeral car, order of service leaflets, a vicar and football song ‘hymns’. Keiran had been in a relationship for a few months and it felt like he had died because none of us had seen him since then and he wasn’t replying to any of our group texts or mails. A couple of weeks ago we were all in the pub and we all started saying RIP Keiran so we decided if he wasn’t going to come out with us and was going to pretend he was dead then we’d organise a funeral for him. He had no idea what was going on. He thought he was coming out to watch the rugby but he came out the back of the pub and we were all there waiting. It was so hard to keep it a secret. One of the boys, Shaun Bundy, organised most of it and he spent Friday and Saturday making the coffin. Another one of the boys, Daniel Bundock, was the vicar, and gave speeches from the Old Testament, and Matthew Lewis wrote a song especially in Keiran’s memory, to the tune of the Kaiser Chiefs song Ruby. I borrowed a funeral car and we drove the coffin from pub to pub, with the vicar in front and all of the boys in procession behind it. The roads were completely closed off, it was epic. 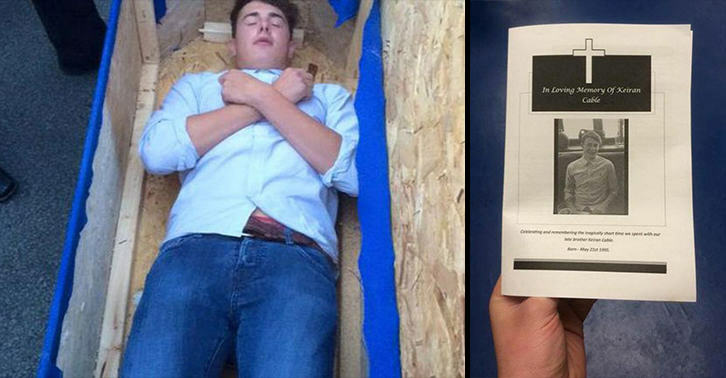 The Order of Service leaflets were just as creative, titled ‘In Loving Memory of Keiran Cable’. Thoughts are with friends of Keiran at this dark time. However they shouldn’t grieve for him but wish him luck as he continues on in his next life. Keiran has had a tough 18 months trying to keep his friendship with his friends alive but sadly the wait is now over and has floated up to the gates of heaven. What hurts the most is that we were starved of precious time to say our last goodbyes after his relationship status was changed from ‘Single’ to ‘In a Relationship’. It is now time for us to finally say our last goodbyes by raising a glass for our friend Keiran. Luckily, Keiran loved the effort his mates had gone to and took it all in his stride, adding: “My cheeks were aching from smiling so much. The boys made a massive effort and it was definitely a day to remember”. This is absolutely phenomenal work from these guys. After this, Kieran had better start hanging out with them more or who knows that they’ll do next time!